WeAllSew Celebrates Our Loyal Fans! Hitting 52,000 likes means it’s time for another giveaway! We very quickly gained another 1,000 fans to hit 52,000 likes on our Facebook fan page—we love our fans! As a way to say “Thank You!” to all who join us at Facebook to share your love of sewing and creating with us, we are holding a another special giveaway! 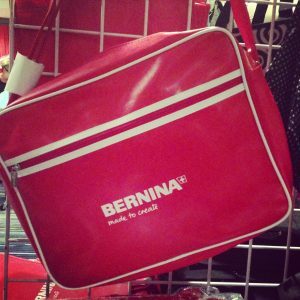 If you are already a fan of BERNINA USA on Facebook, then you know that we’ve pledged to host a giveaway with a chance to win fun prizes like goody-bags, sewing books and even fabrics right here each and every time we gain another 1,000 likes through the end of 2013! Join in the fun by clicking over to our fan page, Like us, and be sure to keep your eyes open for our next giveaway. What is your favorite WeAllSew project or tutorial? Sweepstakes Rules: Open to residents of the 50 United States and the District of Columbia. One comment per fan. Comment must be submitted to the WeAllSew.com blog within 24 hours after blog post posting by Thursday, July 18 12:00 midnight Central Time. Winner will be chosen randomly. Winner announcement one week after sweepstakes ends. Our WeAllsew.com fan “sharik” is the winner! Congratulations sharik and enjoy your BERNINA retro bag! Next Next post: The Summer of No Pants Pinterest Contest Winners! I haven’t found a bad one yet…. they are all my favorites. Please keep up the great work. I love the How To Hem Jeans tutorial, but the ultimate on-going spot was the Libby Lehman Name That Stitch videos – awesome! Miss them and hope Libby is progressing. Thanks! I love the Blanket In a Bag by Nicole Smith. Thanks for the chance to win! I think the tooth fairy pillow is one of my favorites. Hadn’t given that a thought, but my grandson will soon be dealing with the tooth fairy and I loved this idea. I’m so happy we can make the “event” even more special for him! Thanks to Stacy Sews and We All Sew for such a great idea. There isn’t one specific project I like, but I look for those projects that allow me to combine my embroidery with quilting. I enjoy both and like to combine when ever possible. I love any of the tutorials showcasing presser feet and the wonderful things that can be done to enhance a project. I own many of these feet and never use them because I am just not sure how to do so correctly. These tutorials give me just the right ‘push’ to try new things. How fun to have another giveaway. I enjoy most of your sewing ideas. One of my favorite tutorials is the Gathered Tote Tutorial. I’m just getting in to embroidery, so I’m sure to have new favorites. The quilted casserole carrier. We go to a lot of potluck type events and that carrier is perfect. I really liked the messenger bag tutorial. My favorite is the circle quilt tutorial. but how can a person really pick a favorite? I get so confused by which interfacing to use so when I read the info on interfacing that straightened everything out for me. Thanks. I liked the Trick-or-Treat Bags by Stacy Schlyer, mostly because the are so useful and fun to carry! I love the sunrise quilt….it reminds me of the AZ sunrise. I really like the monster bag tutorial! My favorite WeAllSew tutorial is the Snuggly Owl of course! Or the Lavender Sachet. Or the Wine Tote! I’ve made and love them all! I like JCasa’s interactive greeting card. I love today’s tutorial with the embroidery hoop caddy! Clever and nice way to bring fabric choice into a functional tool! Favorite is the tooth fairy pillow. I really enjoyed the Coiled Rope Baskets. I have made two of them and plan on making at least 3 more for my house, ones for my mother in law. The directions were so easy to understand and it was fun to see the bowl appear as I was sewing it. I love the Easter Table Topper! I love this little dress!! quick and easy to make – and so many ways to change it!! I love Jo’s Scrappy Plaid Quilt. I have started going through closets and will go visit some thrift shops in my area to make one for myself. I love that you can make something new and comfy from old shirts. I enjoy finding ways to repurpose old things. My favorite is the Altered Couture Jean Jacket. I’m always on the lookout for jean jackets at yard sales and ebay so I can have fun changing them for my kids or husband. For me, I love any of the kitchen items. Table toppers, mug rugs, special things to make your kitchen a brighter place. It was so hard to pick but I have to say I loved the “Just wing it” Baby receiving blanket. I like the make up brush roll. It can be made for quilting tools too! Perfect for retreats! I absolutely love your site. You give us tips and tricks to assist us to be more skillful and creative! I LOVED your tablet cover project! I improvised and added some decorative stitching, along with a shoulder strap for a friend of mine! what an easy and great project! Please keep them coming! Your projects are quick and easy, and I love the diversity! Your stitch recipes are so great as well. Please keep them all coming! My favorite is the western mug rug, I made a mug rug for my sons Bass. The most recent one was the Tooth Fairy Pillow by Stacy Schlyer. I love the casserole carrier project. Thanks for the giveaway!!! I found the Jeans hemming tutorial to be really helpful, but my absolute favourites are the various foot showcases. I’m drooling over the ruffler, and seriously jonesing for the binding attachment feet. Is this the We All Sew blog site where I am to leave the answer to the question, “What is your favorite WeAllSew project or tutorial?” If so, where are all the other comments/entries? T-Shirt Shrink Down by Kathryn Goodman. (I do have a lot of “favorites”. Thank you very much. I love all of them, can’t pick a favorite. Bernina rocks! I ALWAYS love seeing the use for all the wonderful Bernina feet. The #3 foot is now one of my favorite. Blog post I liked . . .I don’t have to go back far. Learning how to finish the edge for napkins without a serger was great! Congrats on your 52,000 likes. I learned to sew on my mother’s Bernina. It was one thing I inherited from her when she died. Most of my clothes I wore in high school was made on it. You make a great product. Thanks. Sorry, forgot to comment on the best project. Too many good ones to choose from. I like most of them. I enjoy them all, but particularly the latest is the casserole carrier. Congrats! I’m new to the site but can’t wait to find a favorite! I have really enjoyed making aprons lately so my favorite project is sew an apron and show your gratitude. I really want to remember to celebrate national tie one on day this year. This is a great craft project and must have for any sewist… I’m always fiddling around looking for that darn tomato as it gets buried under scraps on my table. Congratulations on reaching another milestone! Currently love following the fabric design contest-what creativity! I can’t pick! They’re all great!! My favorite is DIY Tablet Case by Mimi G for WeAllSew. I like small and fast projects. https://weallsew.com/2013/07/09/sandis-holiday-table-runner/ I love quilting and especially scrappy quilting, this runner is perfect for they style I like! thanks for the offer! and LOVE my Berninas, I have 3 machines! I found “Which interfacing goes where” to be very helpful and so I will choose that. However I really think they all so great. One of my favorite projects was http://stacysewsblog.wordpress.com/2013/07/05/tooth-fairy-pillow/ my granddaughter just loved it!! This is my favorite and on my list of Projects to do! How do you decide on a favorite project or tutorial. I like the “feet” tutorials. I don’t use my machine for all I could and this really helps me stretch my skills. I love pin cushions, can never have enough! Would love to win your bag of goodies. Thanks. I love the Sunrise Baby Quilt! Thanks for hosting this great giveaway (I love that retro bag!) and thanks for your inspiring blog. I want to make one or more of the coiled rope basket. Enjoyed holiday Peace, Joy towels, also plan to make the Tooth Fairy pillow. Great ideas! i loved the embroidered coasters project! I like the “Sew to Serve” pages. There is such a great need to help the less fortunate and this is a connection to worthy sites. I like the ideas on how to use the different feet and attachments that I’ve bought for my Bernina. My favorite ARE the tutorials/seminars you hold. I have sat in on a couple of them and have learned some valuable tips that I have not learned elsewhere in the 30+ years of sewing. I guess you are never too old to learn something!! Thank you. I love the Bernina FB page! I get updates and WeAllSew by email too! I have been sewing on a Bernina 1530 for over twenty years! My favorite project was the polka-dot clutch. I made it for a friend’s birthday and it was a huge hit! It was very easy to follow the directions and the photos were great. Thank you for the wonderful projects. I like the quilting tutorials. I made the tooth fairy pillow for each grandson. They love them. I really enjoy all the projects and tutorials. Thanks. This is actually my first time to the site, so I don’t have a favorite one yet, but I’m excited to check everything out! Thanks for the giveaway! I want to try the Super Hero capes and the kids Messenger Bag. Also the iPad cover. Does the iPad cover have a carrying strap? I would like a cross-body strap. Thanks for a fun giveaway! Love my Bernina! Jo’s Summer Skirt is a great project. I love to wear skirts in the summer because I get tired of wearing shorts. my favorite weallsew project is sandi’s holiday table runner-it’s a sure winner project to get started for the holidays! So many to chose from..love the coiled rope basket…among many others! I liked Amanda’s Use fonts for paintwork. The pretty pincushion projects. They are all good; it is hard to pick just one. Thank you for such an interesting site. I like the tutorial on making pillows. I like the Bohemian Shoulder Bag. I like all of the projects, but this bag especially. That’s like asking me to name my favorite grandchild. It’s not going to happen! Many great projects! Everything Heirloom! Keep it coming!!!! I love all the gift projects and DIY!!! They are all great but I love anything from Mimi G and Ashley of Make It and Love It! I like the tooth fairy pillow although it will be a while before my grand baby loses any teeth; still getting baby teeth right now. My favorite is the “Serged Tank Top”. I made it and it fit! Just 1 favorite? That’s impossible! Love them all! I have been looking for an easy tooth fairy pillow for the granddaughter, and the one here at weallsew.com is it! Thanks for wonderful projects. I love so many, the toothfairy pillow is just one of the more recent ones. I like all the quilt related ones especially the scrappy ones. Looking for more ideas for my 830 to embroider on quilts. Thanks. I love Tea Time Tutorials. They are my favorites. Hands dowm, Snuggly Owl. So much fun. Love the tooth fairy pillow!!! Love the watermelon placemat. Lots of great ideas and projects. I have used several project ideas at the quilt shop that I work at. They are fun projects to sew. Thanks for the projects. No question the Name That Stitch series by Libby Lehman. I’ve learned a great deal from those lessons. The current project is always my favorite as I look forward each month to new inspiration and motivation. I like the Bohemian Shoulder bag. Love the colors and the use of the circle attachment. My favorite project is the Beach Bound Straw Tote. It is very appealing and has been nicely finished. I like everything but I especially like embroidery and quilting. If I had to pick one, I’d say the tooth fairy pillow. Since I am the grandmother of 12 grandchildren my favorite project is of course the tooth fairy pillow!!!!! Am I excited! I hadn’t clued in about the offerings on the We All Sew webpage until I saw the posting on Facebook. I had liked the Bernina Facebook and knew about the online sewing magazine. So, now that I have discovered it, I am immediately drawn to the Snuggly Owl pillow. I will definitely be making that! I like the strips for strips for stripes tote! I really like the tooth fairy pillow, but I really love the children’s super hero capes! I love Kari Carr’s Straight and Narrow Quilt! Easy and versatile! I love the beach bag project. I can never have enough tote bags and this is just so summery. Love everything about We All Sew! I like Jo’s scrapy plaid quilt ! I like most everything, but the watermelon table runner is adorable! My favorite is Sandi’s table topper tutorial! Love them all, can’t pick just one! My favorite is usually the newest one. You guys have such great ideas. Thanks. I love every one about quilts! Can’t get enough!!! Thanks, Bernina! My favorites feature how to help with veterans quilt, the Boston bombing, OK City, keep up the good work! My favorite project is one that I have yet to do! I am totally in love with the western rug mugs and I can’t wait to purchase the design works so I can make a set to go with the western decor in my home!! I like the DIY tablet cover. What Can Make A Kid Feel “Super”? Super Hero capes! I like the Owlivia Slouch Bag: A Blank Canvas. I would love to win the retro Bernina bag. So many to pick from…but I really want to try the vintage linen tablecloth and a messenger bag you posted a while back. I have printed the tutorial for future use. I like Jo’s scrappy Plaid Quilt. I am using a version of it to make a quilt for a girl from her father’s shirts. I just love all your projects. Just wish I could afford a new machine. Thanks for the giveaway. Love the ruffled towels tutorial! I’m new to the site and haven’t looked around much, but so fat I like the piping tutorial. I like anything that combines embroidery and quilting… I really liked the quilted casserole carrier! Jo’s Scrappy Plaid Quilt is cute….makes me want to try a new skill! It inspires me to be even more colorful and innovative! Monster Bag for sure! I also love the tooth fairy pillow. Our tooth fairy leaves a new toothbrush. Hard to pick one! They are all great. I’m making shower gifts and the “Just Wing It” baby receiving blanket tutorial adds the WOW factor to my blankets. The tutorial for how to hem jeans was something I can really use a lot, so it’s my favorite. I also liked the hot and cold neck wrap project . It was super easy and super useful. Tooth Fairy Pillow was just too cute! Gosh, the projects are all really cute, fun and they have great instructions. thank you. My favorite project is Melissa Mortensen’s Beach Bound Straw Tote. I gravitate towards purse and tote projects and tutorials and since I live near the SE coast this especially caught my eye. I like the use of unconvential material (straw) and applique. It made my creative juices flow on other ways to combine these materials – maybe a more durable straw beach mat with pockets. I love the free patterns. The Zipped Up Selvage Pouch!! I like all the different tote bags. I love making them. Any that show me new products that make sewing fun & easy. My favorite project, which i made for my new grandson, was the Sunrise Quilt. I enjoy all on we all sew! Favorite stop of the day! Zipper pouches, table runners, quilts , help with garment sewing has all been invaluable to me! The best is you support is with your wonderful sewing machines with these projects. There are too many to choose one but since we are in summer ill say the watermelons placemats are the hit of the season! I’ve just found you and am finding lots of great projects – no idea what’s my favorite yet! Western mug rug and video tutorials from Bernina. It is so hard to choose, but the Gorgeous Gathered Bag Tutorial is probably my most favorite. I love the idea of the selvage pouch. Any ideas using up scraps is a great idea! Fabric is expensive and the more ways to use up our scraps we will normally throw away is a great economical and planet friendly project! I really like the Beach Bound Straw Tote-but they’re all great! I love all the projects because they inspire me creatively! From the past, Bohemian bag. More recently, zip selvage bag. The serged tank top is super easy and fast. Also will be making the selvage bag.